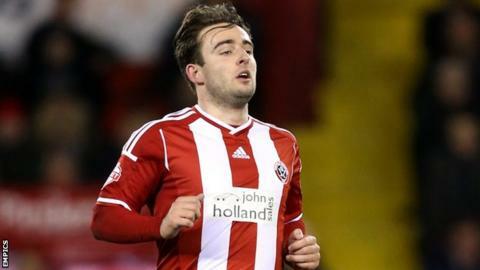 League One side Sheffield United have suspended forward Jose Baxter after he failed an out-of-competition Football Association drugs test. A statement on the Blades' website said "traces of a banned substance" were found when Baxter underwent testing. "The player has informed the club that he engaged in no wrongdoing involving any banned substance," it added. The 23-year-old scored 13 goals in 48 league and cup games for United during the 2014-15 campaign. The news comes one day after Hull City midfielder Jake Livermore was suspended by the FA and his club following a positive test for cocaine. Baxter started his career at Everton and signed a three-year deal at Bramall Lane after moving from Oldham Athletic in August 2013 for an undisclosed fee. The statement added: "Established policy in these circumstances requires that the club temporarily suspend the player pending further findings. "The club has taken this step without prejudice to the player's claim of no wrongdoing." Sheffield United finished fifth in the League One table before losing 7-6 on aggregate to Swindon Town in the play-off semi-finals.